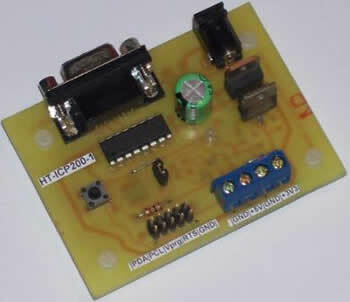 HT-ICP200: ICP Programming Board for P89LPC900 Series Micro-Controller. In-Circuit Programming (ICP) is a method intended to allow commercial programmers to program and erase P89LPC900 series devices without removing the micro-controller from the system. The ICP facility consists of a series of internal hardware resources to facilitate remote programming of the P89LPC900 through a two-wire serial interface. NXP made ICP in an embedded application possible with a minimum of additional expense in components and circuit board area. The ICP function uses five pins (VDD, VSS, P0.5, P0.4, and RST). Only a small connector needs to be available to interface your application to an external programmer in order to use this feature. The ICP programming method is a serial programming method, shifting in programming commands and shifting data in and out with a clock and dataline. The latest software revision can be loaded into the product before shipping. Field updates can be made when reprogramming the chip on the application board. In the debug stage of development the chip can stay on the application board while being reprogrammed. FlashMagic is the preferred software used to perform ISP on the P89LPC900 series of Flash Microcontrollers that support this programming method. 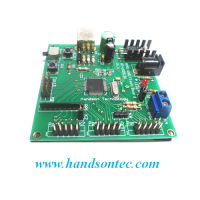 To provide the same programming Interface but still do the ICP programming method that the LPC90x devices require, we had developed ISP-to-ICP Bridge Board HT-ICP200 that can translate between ISP and ICP. 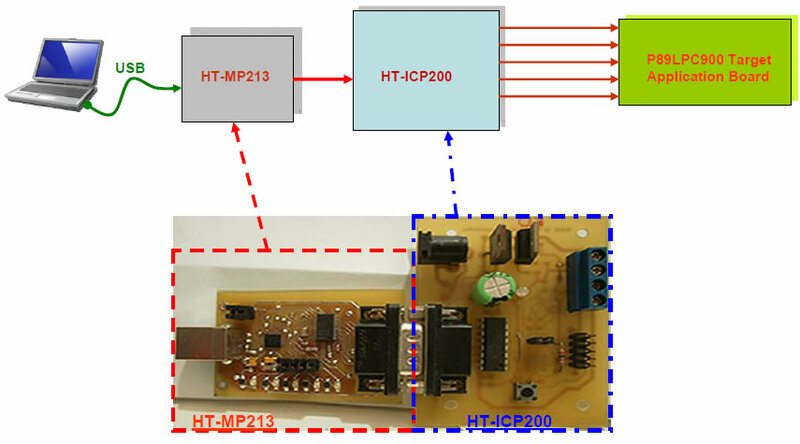 By adding another USB-to-UART Board HT-MP213 to HT-ICP200, you will have USB connection to program the NXP P89LPC900 series of μ-controller.